Oil pools in between inflatable boombs near Grand Isle, Louisiana, on Saturday. 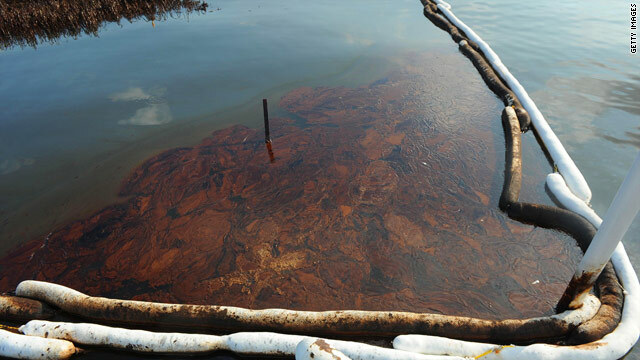 (CNN) -- While cleanup crews and technical teams continue efforts to stop crude gushing into the Gulf of Mexico, Louisiana lawmakers are proposing a different approach: prayer. As much as 60,000 barrels (2.5 million gallons) of oil may be gushing into the Gulf every day, new government estimates found last week. BP said it was able to capture roughly 8,480 barrels of oil from midnight to 12 p.m. Saturday. The company said it captured 24,500 barrels -- just over a million gallons -- of oil Friday, a little less than it captured the day before. BP said Saturday that it has paid $104 million to residents along the Gulf Coast who have filed claims related to the Gulf oil spill, issuing more than 31,000 checks in the past seven weeks. There was no immediate response from local, state or federal officials to BP's tally of its payments. Meanwhile, oil recovery efforts in the Gulf resumed Saturday morning on the drill ship Discoverer Enterprise, after work was suspended for about 10 hours because of a mechanical problem. A venting device aboard the drilling ship as not working properly, said Ayla Kelley, spokesperson for the Deepwater Horizon command center. Other recovery efforts continued during the time that the Discoverer Enterprise was idled, she said. She said the problem was with a blocked flame arrester, designed to prevent oil from combusting by extinguishing the flame.